In 1822, the British Government established a trial emigration scheme for Irish paupers to Upper Canada. There were two waves of emigration, one in 1823 the second in 1825. Peter Robinson arranged for these impoverished Irish emigrants to come to Upper Canada. In 1825, 2024 passengers on board nine ships - Fortitude, Resolution, Albion, Brunswick, Star, Amity, Regulus, Elizabeth, and John Barry - arrived in Quebec. From there the emigrants made their way to Upper Canada (present day Ontario). Passenger Lists for these ships are available online but Olive Tree Genealogy has been busy compiling a new project which contains much more information on many of the Irish passengers. The new project is the extraction of names from Surgeons Medical Journals which were kept during the voyages. There are medical journals for 8 ships and they contain a great deal of information. Olive Tree Genealogy's project contains extracted details of the voyage, the names and ages of each passenger treated by the surgeon, the date they were put on the sick list, where the ship was at the time and the date they recovered or died. Births of children are also recorded as are deaths, sometimes with details as to exact time and location. Surgeon's Journal of the Transport Ship John Barry between 22 April to 25 July 1825 during which time the said ship has been employed in conveying the Irish Emigrant Settlers from Cork to Quebec. Surgeon's Journal of the Transport Ship Amity between 5 April to 9 July 1825 during which time the said ship has been employed in conveying the Irish Emigrant Settlers from Cork to Quebec. Surgeon's Journal of the Transport Ship Elizabeth between 4 May 1825 & 21st July 1825 during which time the said ship has been employed in conveying the Irish Emigrant Settlers from Cork to Quebec. Medical and surgical journal of the Star transport ship for 6 April to 13 July 1825 by Ninian McMorris, Surgeon and Superintendent, during which time the said ship was employed in conveying emigrants to Quebec. Medical and surgical journal of the Regulus transport ship for 7 April to 13 July 1825 by Matthew Burnside, Surgeon and Superintendent conveying the Irish Emigrant Settlers from Cork to Quebec. Medical and surgical journal of the Fortitude Emigrant Ship for 28 April to 1 July 1825 by Francis Connin, Surgeon and Superintendent conveying the Irish Emigrant Settlers from Cork to Quebec. Medical and surgical journal of the Albion Convict Ship, for 4 April to 4 July 1825 by John Thomson Surgeon and Superintendent, during which time the said vessel was employed in conveying emigrants from Cork to Quebec. The surgeons' journals contain much detail both on the illnesses of each passenger and on the journey itself. Some surgeons recorded their thoughts about certain passengers so they are a very interesting read. Two of the ships medical journals are available online as a .pdf file at the National Archives UK website. The other medical journals are available for a fee from the National Archives UK website. All source files are provided so you can enjoy reading the entire journals or ordering ones of interest. Warning: Some of the journal entries are very distressing to read. Today's featured database are the online (free) records for Grace Church in Jamaica New York. The following genealogy records have been published on Olive Tree Genealogy website. Just visit the New York Church Records section and click on the links for each of the following set of Baptisms, Burials and Marriages. This journal (which adds the comment "during which time the said ship has been employed in conveying the Irish Emigrant Settlers from Cork to Quebec.") consists of 55 pages of detailed notes on each of the 21 Irish passengers Surgeon Power treated. I have extracted the names, ages, dates of admission, whether the patient died or recovered and a few notes for some patients. Most patients have their illnesses noted in detail, along with medicines given, reaction of patient and other data. The wealth of information is incredible and there are interesting, albeit horrifying, descriptions of life on board the ship as well as some of the more ghastly medical problems passengers presented with - such as a 7 1/2 foot (Yes, I said FOOT, not inches...) long intestinal worm. This Surgeon's Journal comes from the newly added Surgeons at Sea - Royal Navy Medical Officers' journals on National Archives UK. The series consists of journals and diaries compiled by Royal Navy surgeons and assistant surgeons who served on HM ships, hospitals, naval brigades, shore parties and on emigrant and convict ships in the period 1793 to 1880. Many of the journals were for ships sailing to Australia. A Celebration of Family History Is Now Available on DVD! SALT LAKE CITY—A major 2010 highlight in Salt Lake City was definitely A Celebration of Family History—a once-in-a-lifetime event that will never be forgotten by those fortunate enough to have attended. Now, all can enjoy this remarkable, inspiring event on DVD. To purchase the video (which will sell for $4.50, includes shipping and handling) or watch video highlights, go to celebration.familysearch.org. The DVD features a celebration of family history through music, stories, and the captivating words of renowned author and historian David McCullough and President Henry B. Eyring of the First Presidency of The Church of Jesus Christ of Latter-day Saints. The event includes moving musical numbers by the famous Mormon Tabernacle Choir and Orchestra at Temple Square and inspiring video presentations showing the impact family history can have on individual lives. The talks, music, and films can be played as a single program, or they can be viewed as individual segments for those wishing to use the video as a teaching or reference aid. The presentations are sure to inspire those looking for additional insights into family history. The first thing you should realize is that no amount of begging or asking or demanding is going to make Aunt Hattie change her mind. There are a few "tricks" you can try though! 1. Try to find out (gently) what her objection is to your seeing the documents and photos. There may be something which she considers a disgrace and if so, it will be your job to reassure her that you can be trusted. Don't lie to her though. If your intent is to share the facts with your entire family, then don't tell her you won't tell a soul. 2. Mean what you say. "I won't tell anyone else" means that you will keep quiet about whatever she shows you. Some will disagree with me but in my mind that promise only lasts while Aunt Hattie is living. After she is gone, you may have to make some decisions about sharing or not sharing what you have learned. 3. Visit or phone Aunt Hattie frequently. Not to ask questions but to talk, take her out for a meal, just sit and have tea or coffee with her. Get her talking about her childhood and enjoy her stories. Eventually she may relax and start showing you items from her treasures. 4. Take Aunt Hattie your own photos or documents - don't overwhelm her, just take one or two each time you visit. Show them to her, talk about the people and what the photos or documents mean to you. When Auntie sees your passion and genuine caring for the people involved, she may relent and share her items with you. 5. Be patient. It may take your Auntie a year or more to decide you shall be privy to the family secrets. Don't push her and don't rush her. Let her come around (if she does) in her own time and her own way. 6. Try an end run - find out who Aunt Hattie is closest to in the family and get them on your side. They can gently work their magic with her and hopefully persuade her to share. 7. Don't give up. But don't be overbearing either. In my hubby's family he had a step grandmother who would not talk about his grandfather's misdeeds - which were quite outrageous! Eventually she opened up and filled us in on quite a bit. Patience and getting to know us were the magic that worked for us. It's Movie Monday and today's video is the complete Ships Passenger List of the Lahn. The Lahn sailed from Bemen Germany and Southampton to New York on 24 November 1888. Join us on Olive Tree Genealogy YouTube Channel for more ships passenger lists, Cemetery Walks and other genealogy videos. If you want to be notified when new videos are uploaded, just SUBSCRIBE (it's free) once you are on the channel. Do You Have a Clue? ...a Census Clue? Census records are invaluable for genealogists. We all know to start with the most recent census for our area of interest, and work backwards. I think most of us know that from a census record we can figure out family groups, get approximate years of birth and birth locations. But what else do census records tell us? Of course it depends on the year of the record and the country it was taken in. But let's talk generalities. When you consult a census page you should always check names of neighbours. Often a neighbour is a father or a brother or a married sister (or some other relative). Be sure to copy the entire page so you can refer to it later. Check the occupation of each individual. Often that provides clues for other research. If a man's occupation is given as farmer, you will want to hunt for land records. If he is a skilled worker (blacksmith for example) you may want to check City Directories to see if he is listed. Perhaps his place of employment is given in a more recent census. Now you can hunt for details on that workplace; perhaps they even have records you can consult. What about religion? In Canadian census records Religion is provided. This is very helpful in finding church records to hunt for baptisms, marriages or burials. Census records may also provide an approximate year of immigration or of naturalization. I use the word "approximate" because those two years are often mis-remembered. You need to search a year or two on either side of any year given. Just as one example, the 1900, 1910 ,1920 and 1930 American census records identify citizenship status, with notations showing the individual was an Alien, or had started the Naturalization process or had his final papers. Some early (1841/1842) census records for Canada give a year of immigration if the individual lived at any time outside of Canada. Later census records also provide a year of immigration for individuals not born in Canada. Marriage years are also found on some census records. Some census ask for a year of marriage, some ask how old each married person was when they first married -- it varies so be aware and read the questions on each census carefully. Questions asked on Canadian Census are given here in full for each available census year. You might be surprised at the wealth of details you can find! Welcome to Part 4 of a 12 month series about finding and using less obvious genealogy records to find ancestors. Almshouse records (or poorhouse records) are often overlooked in our genealogy research. Almshouse records have a two-fold benefit, one obvious, the other not so obvious. I'm sure it's pretty obvious to all of us that records kept for an Almshouse or Poorhouse will include a list of residents. So if your ancestor was impoverished you may find out that he or she was in an Almshouse, and you may find more details that were unknown to you. Also we as genealogists need to realize that in the early 1800's port cities in the USA bore the burden of immigration. By the time they arrived, so many immigrants were tired, hungry and poor they ended up in the City Almshouse. So be sure to check Almshouse records for the port city where your ancestor arrived. Here is where the less obvious benefit comes into play. In my own research into Almshouse records for New York I stumbled on some fascinating information. Within the lists of residents in the almshouse I was researching were the names of the ships each resident sailed on from their homeland to North America. The 1819-1840 Almshouse records contained for each resident the Date of Admission; Age; Place of Birth; Vessel Name; and Where From. A quick glance at the list revealed many of the residents were entire families. Many left from Canadian ports which may indicate they first arrived in Canadian ports rather than New York. Canadian arrival ports were much cheaper than American ones. The 1855-1858 Almshouse records I consulted were more detailed. They contained the Individual's name, age, where they were from Name of Ship, Date of sailing, Ports of departure and arrival, Captain's Name, Owner's Name, Date of Bond, Sureties, Date Discharged, Death Date and Remarks. Olive Tree Genealogy has published one side of each ledger page (there are 2 sides per person) for these New York Almshouse records online and you can consult them by using the links given above. I do not know if other port cities in other states contain the same amount of detail in their Almshouse records but it is worth a look if you are hunting for an immigrant ancestor. Explore 11th century England with National Archives UK new Domesday map. You can search by placename or postal code, or browse the map to find out whether your town had a place in the earliest surviving public record. The new Domesday tool shows a map with those places mentioned in William the Conqueror's survey of England in 1086. Visitors to the site can also download photographs from the early 20th century. I gave this a try since my maternal grandparents were both born in England their lineage is solidly English. Some of the towns where my ancestors lived were Ramsgate, Chilham, Lenham, Pluckley, and more. The search area for the maps was extremely slow to load but hopefully this is due to visitor interest and not the website itself. Using IE8, the map never loaded and did not display. A search for "Ramsgate" in IE8 had still not provided text results after 4 minutes, so I switched to Firefox. Using Firefox the map displayed very quickly and a search for "Lenham" brought text results in 2 minutes. But searching for "Pluckley" hadn't displayed results even after 4 minutes of waiting. I will try again and hope that the site is just busy this morning. Hubby and I often play a silly little genealogy game. It's silly but oh boy it's a lot of fun - and takes some serious thinking! We call it "If I had a Time Machine..." and it requires you to say what you would do (genealogy-wise only) if you could travel back in time. Would you save the church records from the church that burnt, the one where your family lived in the early 1800s? Would you grab your 5th great grandparents' family bible and bring it back to the present with you? Would you hunt for clues to your 4th great grandma's parents' names? The rules are that you can't save a life, and you can't ask questions of your ancestors. In other words, no interaction with the people in the past. You also cannot bring a camera or scanner with you! But you *can* rescue objects (a family bible, church records, trunk full of family documents....) and you *can* bring one item back with you to study in the present. The second is visiting 1800 Niagara area of Ontario to find out if Jacob Peer has a family bible or any clues for me as to his parents! Oh gosh but I'd also like to see his marriage record to find out his wife Anne's maiden name. I also shouldn't overlook the chance to visit my UEL ancestor Cornelius Vollick and his wife Eve Larroway anytime between 1809 and 1820 to see if my ancestor Richard is really their son! What would you do if you had a genealogy time machine? What ancestor would you visit and in what time period and what are you hoping to find out? First up is an overgrown cemetery in Arkell Ontario. It's called Farnham Cemetery and many of my King and Bell ancestors are buried here. This is only half the cemetery, I will be creating another video this week with the rest of the gravestone photos. In conjunction with this Cemetery Walk through Farnham Cemetery, there is a Group page for Arkell, Wellington County Pioneers on Facebook. It's free to join, just click the link and sign up. Next is the second video of the new St. Michael's Catholic Cemetery in Orillia Ontario. There are 218 photos; some are going on AncestorsAtRest.com while some are being made into videos, so stay tuned! This set of Royal Albert China has had an interesting journey. My mother-in-law passed it to me just last week and its adventures are too fascinating not to share. In 1859 my husband's great great great grandfather William Massey bought land on Waterloo Street in St. Mary's Ontario. There he built a small house for his growing family. One of his daughters was 5 years old when the house was built and she recalled in later years that she remembered her handmade wooden cradle sitting on the newly laid floor of the house. ﻿﻿Over the years the house had many additions but it never left Massey ownership. William's son Thomas, my husband's 2nd great grandfather, was born in that home, and he was the next owner. At some point Thomas' wife Harriet came into possession of this china. Harriet (Purdue) Massey died in 1945 and the china, still in its original crates, passed to the next Massey who also took ownership of the house. We do not know if Harriet used it and it was simply re-packed for the auction, but it is not a complete set so it seems possible she did use it and over the years a few pieces may have been broken. 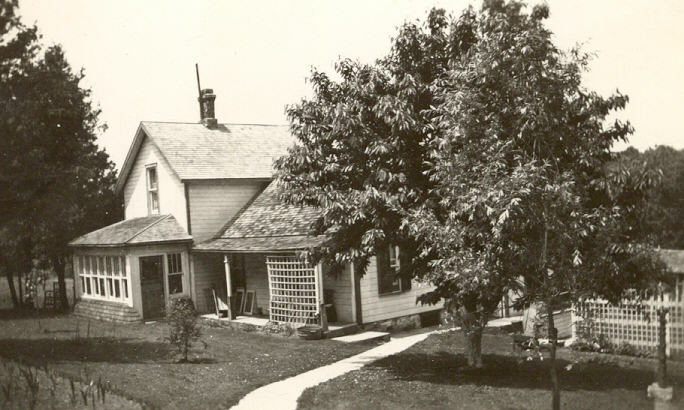 In the early 1970s the last of the Masseys in the original 1859 Massey house died, and the contents were sold at auction. The china, in its original crates, was bought by a man named Wilbert (Wib) Hooper. He gave it to his wife Florence, who co-incidentally was the aunt of my husband's mother. So the china, once owned by the Massey family (on hubby's paternal side) now passed into the hands of the Hooper family (on hubby's maternal side through marriage). Florence never opened the crates and the china sat unused until her death in 1996. That is when my mother-in-law (Florence's niece) inherited the unopened, unused china. She displayed it in her china cabinet and used the set a few times over the 14 years she owned it. This past week she passed the china on to her son, my husband. She told me to use it and enjoy it and that is what I plan to do. Although I'm not into big fancy china settings, this lovely set of Old English Rose by Royal Albert will grace our Christmas table this year. And my hubby can enjoy the fact that the Massey china, as it came to be known, has once again passed to a male Massey. Many hands have touched it in the last 70 years and hubby can have the fun of imagining his 2nd great grandparents entertaining guests in their tiny home. They did not have much money and the china was almost certainly the nicest thing they had. And so the china has had its adventurous journey coming into the Massey family in the 1940s, leaving it in the '70s and returning once again in the 90s. This wonderful database was published on Olive Tree Genealogy website thanks to Researcher & Contributor Lucie Servole Myers who donated her work for publication. The Turnbull venture: On March 31, 1768, a fleet consisting of the below-mentioned eight ships left Mahon, Minorca with over 1400 passengers. The fleet arrived in Gibraltar on April 3, 1768, then left Gibraltar on April 17, 1768. Of the 1403 passengers who had left Gibraltar, only 1,255 managed to reach the coast of East Florida as 148 of them perished on the high seas. Three children were born at sea: Eulalia Elquina (Alzina); Antonia Arnau; and Benito Buenaventura (unknown parents). Four of the ships which carried some 700 immigrants, arrived in St. Augustine, Florida on June 26, 1768. The other four vessels had been carried off course by strong currents, but they eventually reached St. Augustine little by little, arriving one after the other, during the month of July, 1768. Lucie has carefully extracted the names of passengers using a variety of sources. "... the Tour is renowned for the genealogy research success of its attendees, many of whom come back year after year..."
It's only 52 days away so take a look at the schedule, the speakers, the events and the genealogists available to help you. If you decide to go, please drop me a note while you're there and let me know what you're doing and how you are benefiting from this annual tour. Have you ever wondered about the town or village your great-great grandmother was from? I have. My maternal grandparents were borth born in Ramsgate, Kent England. Their ancestors (and thus mine) were born in various towns and villages in Kent, Sussex, Devon and other Counties. I've never been to England and have long wondered what the towns they grew up in were like. I've used Google Maps Street View to look for their homes (using addresses on the various census records). I've looked at historic postcards. But I've never thought of checking YouTube until recently. Much to my delight there are many videos, both amateur and professional, giving overviews of various towns and villages in England! Some videos are put out by tourist boards. Some are by people living in a specific town and just walking around while filming. Some are by tourists. But wow, what a treasure trove! One of my ancestors (Hannah Philpot) was born in 1805 in a tiny village called Pluckley, in Kent. I'd no idea it is considered the most haunted village in all of England until I found dozens of YouTube videos about it. Using the videos in conjuction with Google Maps, I am now able to have a good idea of what Hannah experienced and saw with her own eyes. Hannah later moved to Lenham Kent when she married Edward Golding, and a quick search of Lenham in the YouTube search engine brought 103 results. Some of course are more interesting to the genealogist-historian than others! Searching for Ramsgate, where both my grandparents and their parents and their grandparents and so on waaaay back were born, gave me over 2,000 hits. I have only watched a half-dozen but now I have a much better idea of places my grandmother Ruth Fuller talked about. Youtube has added a whole new dimension to my genealogy searches and knowledge of my ancestors. It adds much needed detail and definitely fleshes out those ancestral bones. Good Morning America will be running a segment on genealogy tomorrow morning on their show around 7:45 a.m. They did an interview with Leslie Albrecht Huber, author of The Journey Takers. Apparently someone from Ancestry.com will also be featured but I have no more details. The segment will be posted on the Good Morning America site soon after it runs. Hubs and I share a love of antiques as well as a love of genealogy and history. At an antique auction this weekend, we spotted a beat-up metal storage box. At first we thought it was an Army footlocker. It was painted black and had a name and address stencilled on the top and two of the sides. Its rough shape couldn't hide how well made it is. Although the stencilling was faded and worn on the top, the sides were fairly clear so the name was legible. Hubs best guess re age of the box is 1900 to 1950, and probably closer to 1930-1950. Impulsively we bid on and won this well-used item. It was the name and address that hooked us. The box was sent by L. Pellerin in India to himself in Shawinigan Falls, Quebec. Of course we wanted to find out who L. Pellerin was and do a little genealogy research on him! Part of the street address was missing. We could only read "188 _RIGON STREET" I used Google Maps to look at all the street names in Shawinigan and easily found Rue Frigon (Rue means Street). Clicking on Street View brought me to an actual view of the street and perhaps the very home where this box was delivered! The Drouin Collection on Ancestry.com revealed the marriage of a Louis Arthur Pellerin to Albertine Caron in 1917. Louis was living in Trenton Ontario (a Canadian Air Force base) but the couple married in Shawinigan. In 1891 he was in St. Maurice, St. Etienne des Gres which is Trois-Rivieres, with parents Arthur and Annie (which confirmed the marriage record). Shawinigan is considered part of this area. He was 2 years old so his date of birth was circa 1889. The 1911 census found them in the same general area. It was very difficult to find the family and I had to use many tricks on Ancestry.com - wildcards, no names, dates of birth only, etc. The family was misindexed badly as "Pattersn" Yes - no "o", not "Patterson" but "Pattersn" which isn't even close to the actual name of Pellerin. Louis was misindexed as "Ls"
We were still not certain that our trunk belonged to Louis who was born in 1889. With hubs leaning more towards 1930 to 1950 as the time period, I looked for a son with the initial "L". Once again the Drouin Collection on Ancestry.com came to the rescue and I found a son named Joseph Lucien Yvon was born in July 1929 in Shawinigan. It is almost certain he would be called Lucien and not Joseph. Did he own the trunk? I think we have found the right family and the trunk belonged to either Louis Pellerin (born circa 1889) or his son Lucien born 1929. One of them went to India (we think the sending address is Kundara, S. India) and shipped his trunk back home. Was it military? We are not sure although the trunk does resemble a military footlocker. Did he ship his military kit back home? Was it a personal trip? Did he send back gifts for family members? Even though we are not sure of the provenance of this trunk we feel a connection now to the family who owned it. And that has changed our minds on what to do with the trunk. At first hubs was going to repaint it after cleaning up the rust. But we don't want to paint over the name! So hubs is going to carefully and gently clean it, then leave it as is. Perhaps someone who knows the family or who is a descendant will read this blog post and contact me. Perhaps one day we'll know the full story of L. Pellerin in India shipping something back home to Shawinigan Falls Quebec. It's Movie Monday again! It's also Thanksgiving for me and today is a big turkey leftovers day. I plan on enjoying a turkey sandwich with stuffing, cranberry sauce and lettuce while I watch the movie. We took 218 photos in this cemetery and I've placed the first 25 online in this Video. 50 more will be going online on AncestorsAtRest and the rest will be uploaded as videos over the next few weeks on the OliveTreeGenealogy YouTube channel. Featured Genealogy Database this week is the set of the J & J Cooke Shipping Agents Records. This database of Irish ships passenger lists include 27 ships to St. John New Brunswick, 30 to Pennsylvania, 23 to Quebec and 5 to New Orleans, Louisiana. If your Irish ancestor left Ireland for N. America between 1847 and 1871 you won't want to overlook these lists of passengers. This just in from NARA, and it sounds very interesting! In celebration of Columbus Day join us at the National Archives in Washington, D.C., as archivist Reginald Washington takes us into the stacks to see how our forebears’ Civil War pension files are stored. Wonder with John Humphrey, CG, over German language documents from a New York City Church in his ancestor’s file. Appreciate viewing the Declaration of Independence with John as he contemplates his ancestor’s public reading of that great document in Easton, Pennsylvania on 8 July 1776. An increasing number of “image only” collections are being published on the FamilySearch.org website, signifying a new phase in the site’s digital pipeline. Rather than waiting until the index is complete for each collection, FamilySearch is releasing the digital images as soon as possible in a browsable format. This gives patrons quicker access to records, which they can search in a similar way they would with a microfilm reader. This week FamilySearch published its first digital Chinese collection, along with additional digital image collections from Belgium, Germany, Guatemala, Mexico, Netherlands, Philippines, and Puerto Rico. Twenty million additional indexed records were also published for Civil War and Revolutionary War collections and the 1851 Census for England and Wales. Search these records now at http://Beta.FamilySearch.org. Brick Wall Ancestor? Go AROUND or OVER! We've all encountered it. The infamous brick wall where you are absolutely bogged down researching an ancestor. You can't find any records. You don't know where to look next. You're completely stuck! When this happens, what do you do? Don't waste energy trying to force your way through, go AROUND or OVER that wall! The first thing you need to do is step away. Set the problem aside for a few days, weeks or even months. Then look at it with fresh eyes. Analyse what you have leading up to the brick wall moment. Think outside the box and come up with creative alternatives to the path you were following. Let me give you an example of two brickwalls concerning one ancestor - William Massey. Brick Wall #1: My hubby did not know where in Ireland his 3rd great grandfather William Massey came from. He searched for several years and found many records and documents but nothing gave him the county or town of origin. William is buried in St Mary's Ontario and we've been to the cemetery and seen his tombstone. We have his death certificate. No obituary was found. It suddenly occured to hubby that the cemetery where William is buried is a new one, built several years after William's death. That meant William had been buried in the old cemetery and his remains moved along with others when the new one was built. So hubby found the records of the move from the old to the new cemetery and there it was - the notation from the ORIGINAL cemetery burial records that William Massey was from Wicklow Ireland. Brick Wall #1 solved by thinking about the records already found and coming up with an alternate research plan. Brick Wall #2: Hubby now had a county of origin in Ireland, but how to find a more precise location such as a Town or City? He struggled with this brick wall for many years. Nothing he found gave him more detailed information. The brick wall seemed insurmountable. So hubby did everything you are not supposed to do in genealogy! He began a study of every single Massey name in Wicklow Ireland. He carefully compiled data (massive amounts of it!) on all Masseys living in that county before 1830. This took years. On a hunch he honed in on similar first names (naming patterns) found in his Massey branch. This took him to a smaller geographic location within Wicklow - Delgany. He was treading now on dangerous genealogy ground! He needed to be careful to not make any assumptions based simply on finding similar names. He was careful to look for proof of his hunch - he would not even call it a working theory, it was always just his hunch or best guess. He looked for supporting proof. Even when he found that one branch of the Massey line with those similar first names had left Delgany for Ontario at about the same time as his William Massey, he didn't declare the two lines related. He just kept it as another bit of fodder that strengthened his hunch, and his resolve to keep hunting! Then he connected with two other researchers, both with proven descent from the Delgany Masseys. After a few years of sharing their research findings with each other, my husband decided it was time to take another step. He took a DNA test from Ancestry.com and asked one of the women to have her uncle take the same test. Their Massey ancestor left Delgany for Ontario around the same time his Massey ancestor arrived in Canada and hubby was convinced they shared a common ancestor - but needed proof. The results were conclusive. My husband and his contact's uncle shared a common ancestor. And thus Brick Wall #2 was solved. Overcoming these brick walls took patience (it took my husband almost 20 years), hard work, creative thinking and being careful to not leap to conclusions without proof. So my advice is: don't try to bust through a brick wall with sheer power. Step back, take a break and think about the situation then go AROUND or OVER that seemingly insurmountable hindrance to your genealogy! Genealogy Day: Not as Easy at it Sounded! My first planned Genealogy Day was October 1st and I thought I'd let readers know how it went. Genealogy Day is the day I'm setting aside once a month to work on my own genealogy for a change! My plan was a stay-at-home day with hubby, when we would both organize files and documents on one ancestor. I thought we would also work up a Research plan for each of our ancestors. HA! How naive was I? The day didn't start well. I'm an early riser and figured that by the time hubby woke up 2 hours later, I'd have a good start on Cornelius Vollick's land records. That was all I wanted to do - organize what land records and petitions I have, figure out what I need next, and write out a simple research plan. I spread my Cornelius Vollick file on our dining room table. I sorted and read and organized, all the while realizing I had quite a shambles on my hands. Hubby got up and somehow we both got sidetracked into household chores! It seemed that having set aside a free day we were both obsessed with getting caught up on cleaning and handyman jobs that had been neglected. Note to self: Do the dishes and kitchen cleanup the night before Genealogy Day! No cleaning the fridge or scrubbing toilets either. Housework can wait! By 1 pm I decided that was it, I was sitting down and working on my genealogy without interruption. I was able to do that and worked fairly steadily until 5 pm. I managed to organize all the Upper Canada Land Petitions and township papers I have for Cornelius, his siblings and his father. I checked the online index to see if I'd missed any and was surprised to find I had. I printed off the "hits" from the online index, circled the ones I need, and the ones I want to re-copy due to my poor copy on hand. That was a good feeling! Part 1 of my research plan done! Next month when we go to the Ontario Archives I will get those petitions. Next I sorted township papers. Then I wrote out all the land locations for Cornelius and his family members over the years. That was a huge job! It meant I had no time to figure out the rest of my research plan but it had a positive benefit in that I then took some time to analyse the land locations. I felt that I achieved part of my goal for Genealogy Day 1, but I need to be more focused for the next in-home one. And I will definitely need another in-home Genealogy Day before we venture out on our field trip to the Archives. I'm sorry to say that hubby did not fare quite as well. He didn't settle in to his genealogy until mid-afternoon, and then he quickly became side-tracked by his notes on the Massey branch he wanted to research. I think he ended up mostly reading his previous research notes and running to the computer to look things up on Ancestry.com! He agrees he needs to hone in a specific goal and not allow himself to be distracted. All in all I'm pleased that we started our monthly Genealogy Day and even though I'm disappointed in how little I achieved, I am reminding myself that I got some organization and planning done - and that next time I'll be better at it! Movie Monday: Final Video of St. Michael's Catholic Cemetery in Orillia Ontario. It's Movie Monday and this week's Movie is the final video (three total) of a Cemetery Walk through St. Michael's Catholic Cemetery in Orillia Ontario. There are 70 tombstones in this cemetery. There are 3 videos online on the OliveTreeGenealogy Channel on You-Tube. Video 1 is an overview of the cemetery grounds. Video 2 is a slideshow of photos of the first 25 tombstones as you start walking into the cemetery. Video 3 is a slideshow of photos of 20 tombstones in the cemetery. This older Cemetery is not well maintained, there's no parking and stones are tossed into the bushes. It's on the S. side of Coldwater Rd between Rynard Dr and Emily St. in Orillia.